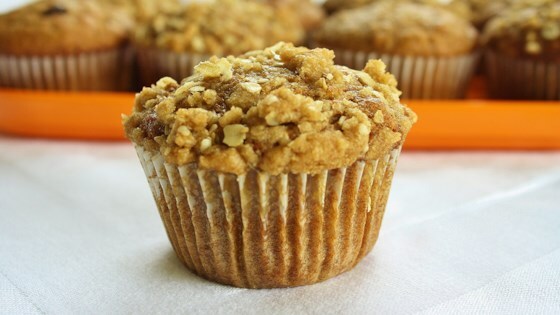 "This is a moist and hearty breakfast muffin made with fresh pumpkin, oatmeal, and brown sugar." Preheat oven to 350 degrees F (175 degrees C). Grease or line 18 muffin cups with paper liners. Combine 2 1/2 cups flour, 1/2 cup oats, pumpkin pie spice, baking soda, baking powder, and salt together in a bowl. Whisk pumpkin puree, 1 cup brown sugar, white sugar, vegetable oil, applesauce, eggs, and vanilla extract together in a separate large bowl. Stir flour mixture into pumpkin mixture; mix well. Fold in raisins. Beat 1/4 cup brown sugar with butter in a bowl until creamy and smooth. Whisk 2 tablespoons oats and 2 tablespoons flour, using a fork, into sugar-butter mixture until streusel topping is crumbly. Great breakfast and easy! I made one dozen and thinned the rest of the batter for pancakes! The best pancakes I've ever had! My family agrees!